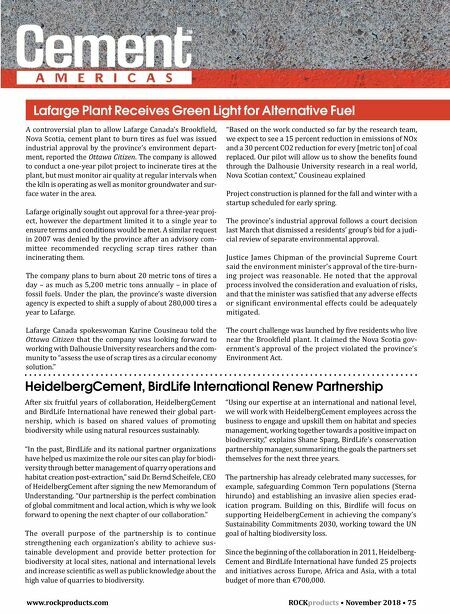 www.rockproducts.com ROCK products • November 2018 • 75 Lafarge Plant Receives Green Light for Alternative Fuel HeidelbergCement, BirdLife International Renew Partnership After six fruitful years of collaboration, HeidelbergCement and BirdLife International have renewed their global part- nership, which is based on shared values of promoting biodiversity while using natural resources sustainably. "In the past, BirdLife and its national partner organizations have helped us maximize the role our sites can play for biodi- versity through better management of quarry operations and habitat creation post-extraction," said Dr. Bernd Scheifele, CEO of HeidelbergCement after signing the new Memorandum of Understanding. "Our partnership is the perfect combination of global commitment and local action, which is why we look forward to opening the next chapter of our collaboration." The overall purpose of the partnership is to continue strengthening each organization's ability to achieve sus- tainable development and provide better protection for biodiversity at local sites, national and international levels and increase scientific as well as public knowledge about the high value of quarries to biodiversity. "Using our expertise at an international and national level, we will work with HeidelbergCement employees across the business to engage and upskill them on habitat and species management, working together towards a positive impact on biodiversity," explains Shane Sparg, BirdLife's conservation partnership manager, summarizing the goals the partners set themselves for the next three years. The partnership has already celebrated many successes, for example, safeguarding Common Tern populations (Sterna hirundo) and establishing an invasive alien species erad- ication program. Building on this, Birdlife will focus on supporting HeidelbergCement in achieving the company's Sustainability Commitments 2030, working toward the UN goal of halting biodiversity loss. Since the beginning of the collaboration in 2011, Heidelberg- Cement and BirdLife International have funded 25 projects and initiatives across Europe, Africa and Asia, with a total budget of more than €700,000. 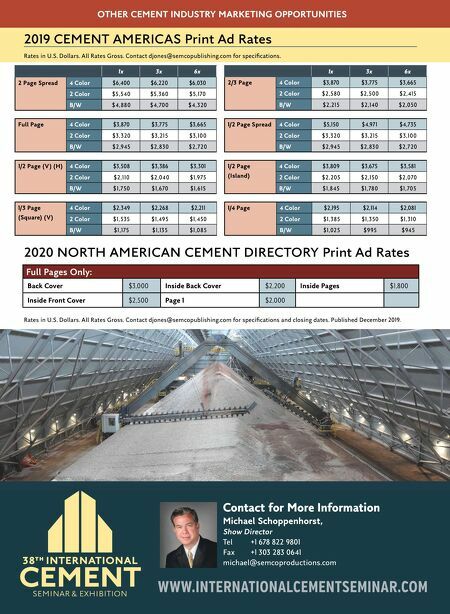 A controversial plan to allow Lafarge Canada's Brookfield, Nova Scotia, cement plant to burn tires as fuel was issued industrial approval by the province's environment depart- ment, reported the Ottawa Citizen. The company is allowed to conduct a one-year pilot project to incinerate tires at the plant, but must monitor air quality at regular intervals when the kiln is operating as well as monitor groundwater and sur- face water in the area. Lafarge originally sought out approval for a three-year proj- ect, however the department limited it to a single year to ensure terms and conditions would be met. A similar request in 2007 was denied by the province after an advisory com- mittee recommended recycling scrap tires rather than incinerating them. The company plans to burn about 20 metric tons of tires a day – as much as 5,200 metric tons annually – in place of fossil fuels. Under the plan, the province's waste diversion agency is expected to shift a supply of about 280,000 tires a year to Lafarge. Lafarge Canada spokeswoman Karine Cousineau told the Ottawa Citizen that the company was looking forward to working with Dalhousie University researchers and the com- munity to "assess the use of scrap tires as a circular economy solution." "Based on the work conducted so far by the research team, we expect to see a 15 percent reduction in emissions of NOx and a 30 percent CO2 reduction for every [metric ton] of coal replaced. Our pilot will allow us to show the benefits found through the Dalhousie University research in a real world, Nova Scotian context," Cousineau explained Project construction is planned for the fall and winter with a startup scheduled for early spring. The province's industrial approval follows a court decision last March that dismissed a residents' group's bid for a judi- cial review of separate environmental approval. Justice James Chipman of the provincial Supreme Court said the environment minister's approval of the tire-burn- ing project was reasonable. He noted that the approval process involved the consideration and evaluation of risks, and that the minister was satisfied that any adverse effects or significant environmental effects could be adequately mitigated. The court challenge was launched by five residents who live near the Brookfield plant. It claimed the Nova Scotia gov- ernment's approval of the project violated the province's Environment Act.